A champion angler has been stripped of his title after being caught cheating. Marty Booth from Hartlepool landed his prizewinning catch outside competing hours of the Paul Roggeman European Open Beach Championship, the BBC understands. Organisers have disqualified him and awarded the title to Chris Fisher from Aldborough, who finished second. Mr Booth has been approached for comment. One angler said the cheating was a "disgrace". The competitor, who wished to remain anonymous, said many of the 1,000-plus anglers who took part were angered, adding: "We spend a lot of money to spend the weekend at the competition and someone has ruined it by cheating." 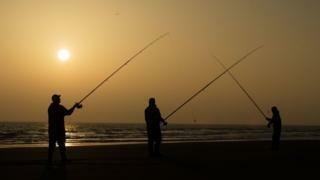 The contest, which is said to be the largest beach fishing tournament in Europe, is held annually over three days at Tunstall on the East Riding of Yorkshire coast. The main championship is held on a Saturday and Sunday with £35,000 in prizes on offer. It is understood that Mr Booth caught his prize-winning catch after the competition had closed on 15 February, but then submitted it as if it had been caught during competition hours on 16 February. A spokesman for organisers East Riding of Yorkshire Council said breaches of the rules were "taken very seriously". He said: "Our aim is to deliver a fair, honest and open event that can be enjoyed by all competitors and the council will not tolerate anyone bringing the reputation of the event into disrepute." The competition was founded by Paul Roggeman in 1994 and was renamed after him in 2016, a year after his death.